Time for a simple American dessert. 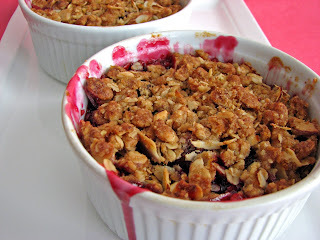 Fresh cherries baked with an oatmeal almond streusel is one of those pleasures that represents total comfort. 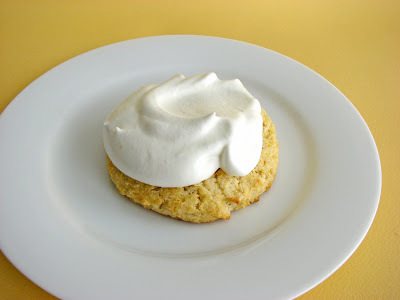 But rather than the standard vanilla ice cream, I’ve decided to serve a tangy Buttermilk Ice Cream alongside. Although it might seem strange to use buttermilk as a central ingredient for ice cream, the end product winds up tasting a bit like the flavor of cheesecake. In other words, it’s delicious. It takes a few minutes to pit the cherries, but otherwise the crisp comes together rather quickly. The same thing goes for the Buttermilk Ice Cream once the base is chilled overnight. 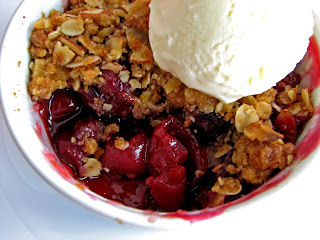 The combination of tart, bright red cherries with the crunch of almonds, the chewiness of oatmeal and the deep caramel flavor of brown sugar can’t be beat. Really simple, really spring, really delicious. 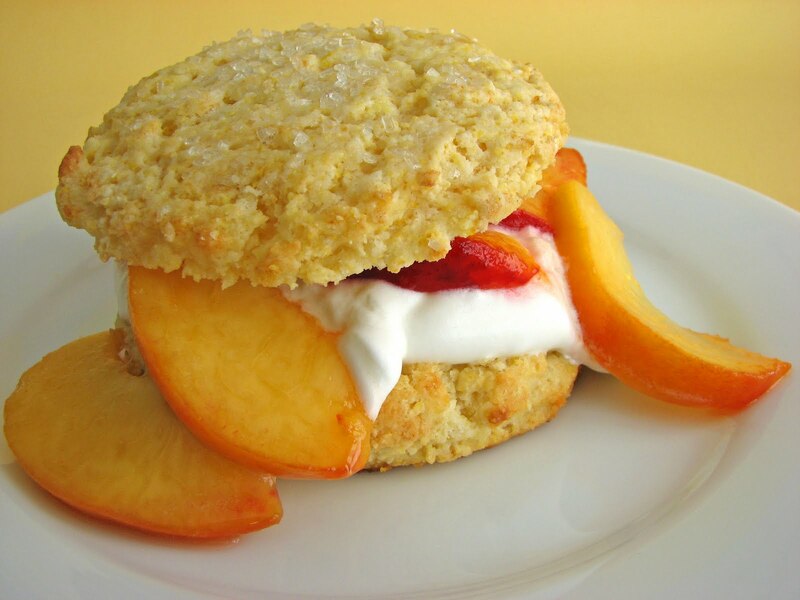 - Buttermilk is made from the tangy liquid that remains from churning cream for butter. Commercial buttermilk doesn’t have the true flavor of the old-fashioned product, so the addition of sour cream helps to add back in some of that complexity. I also prefer less sugar for a more tart flavor, but be sure to taste to see if you’d like it sweeter, especially if you’re adding the sour cream. 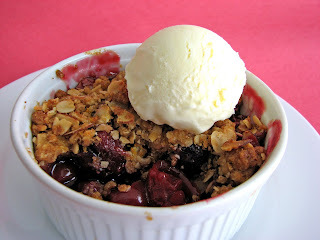 - I’ve also served the Cherry Crisp with Saffron Buttermilk Ice Cream for a very striking combination. Just bring the cream to a simmer and add a scant 1/4 teaspoon of loosely packed saffron threads to the cream to bloom the flavor. Cool the saffron cream and then proceed with the rest of the recipe. 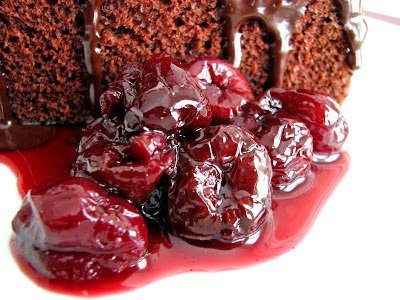 Place the pitted cherries in a bowl. Process the sugar and tapioca together until powdery. Toss with the cherries along with the lemon zest (and kirsch, if using). Let stand while you prepare the streusel. Toss together the almonds, flour, brown sugar, oatmeal, salt and zest. Add the butter and blend until the mixture is coarse. 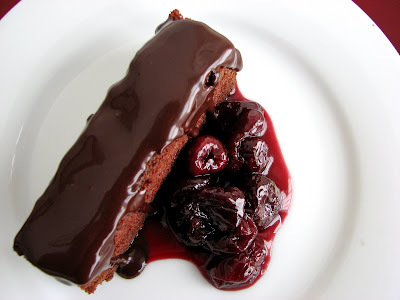 Pour the cherries into a small baking dish or four 4” ramekins. 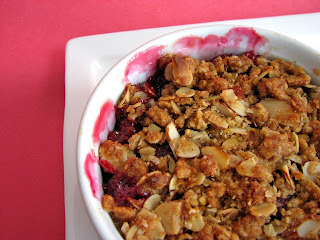 Sprinkle with the streusel and bake for about 25 - 30 minutes or until the topping is browned and the fruit juices are bubbling up. Whisk the cream, buttermilk (and sour cream if using) together. Add the sugar, pinch of salt and the lemon juice, to taste. Chill thoroughly. 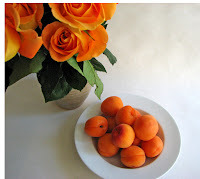 Apricots! Sweet precious apricots have arrived! It’s been a long year, but we now have these gems with us for a short time. I’ve made a very simple Apricot Compote with some honey and vanilla. Pure, sweet and tart. 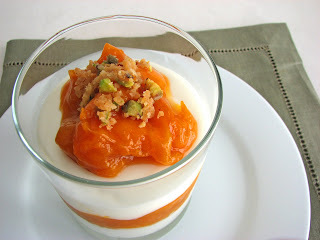 I’ve paired it with a Yogurt Mousse to keep the flavors fresh and sublime. 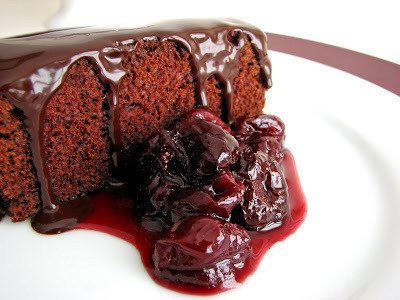 The mousse is so light, it literally melts in your mouth. The yogurt flavor is luscious and the whipped cream elevates it to a super delicious dessert base for any fruit. A sprinkle of pistachio streusel brings a slight and sweet crunch. A wonderful combo and a perfect way to welcome the season. - The pistachio streusel bakes off like a tuile, so don't be alarmed if you see it puddle as it bakes. It will firm up and become crunchy as it cools. Just stir it and break up any clumps so it browns lightly and fairly uniformly. 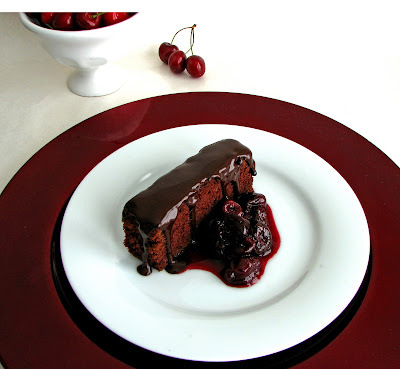 - The gelatin in this mousse is kept at a minimum. Just enough to give it a little body but not enough to interfere with the wonderful texture of both the yogurt and the cream. - To bloom gelatin, always sprinkle it slowly into cold water rather then pouring cold water on the powder or it will clump. 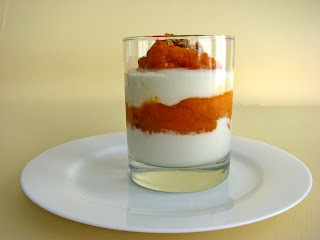 - If you want to layer the mousse and the compote, just pour half the mousse into your parfait glasses and let it set up in the refrigerator for about half an hour. Add a layer of fruit and finish with remaining mousse. Chill to set up and top with remaining fruit. 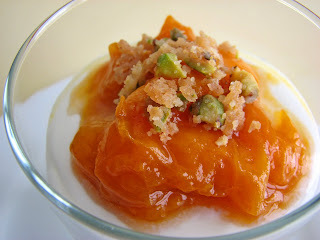 - Save the apricot pits for Noyau Ice Cream. 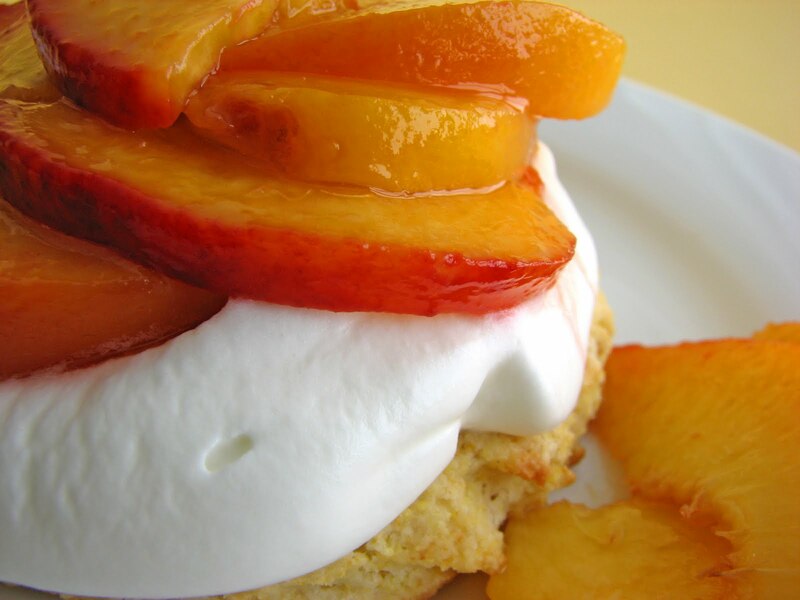 - Now is also the time to enjoy Cornmeal Cake with Apricots. To make the pistachio streusel, whisk the flour and sugar together. Coarsely chop the pistachios and combine with the flour and sugar. Cut the butter into small pieces and add. Using a pastry blender, fork, or your fingers, blend together until you have a crumbly mixture. Chill for about an hour or place in the freezer for about 1/2 hour. To bake, preheat the oven to 325 degrees. Spread an even layer onto a silpat lined baking sheet pan and bake for about ten minutes. Remove from oven, break up the clumps and stir so that the mixture is browning evenly. Return to the oven and bake for about another 5 minutes or so until you see most of it is lightly browned. It will look a bit soft but will firm up as it cools. Once it cools, break up into small pieces and store in an airtight container. Slice each apricots into 6 wedges. Combine the honey, sugar, water and vanilla bean and bring to a boil. Add the apricots and simmer on low heat until the fruit is soft. Remove from heat and add lemon juice to taste. Strain out the juice and return it to the saucepan over medium low heat. Reduce until the sauce is thickened and syrupy, about 15 - 20 minutes. Pour over the apricots. Set aside to cool. Combine the yogurt and sugar. Add the lemon juice. Liquefy the gelatin by placing the bowl in a pan of simmering water or placing in the microwave for a few seconds. Pour into serving dish or four individual parfait glasses. Chill for about 2 hours. 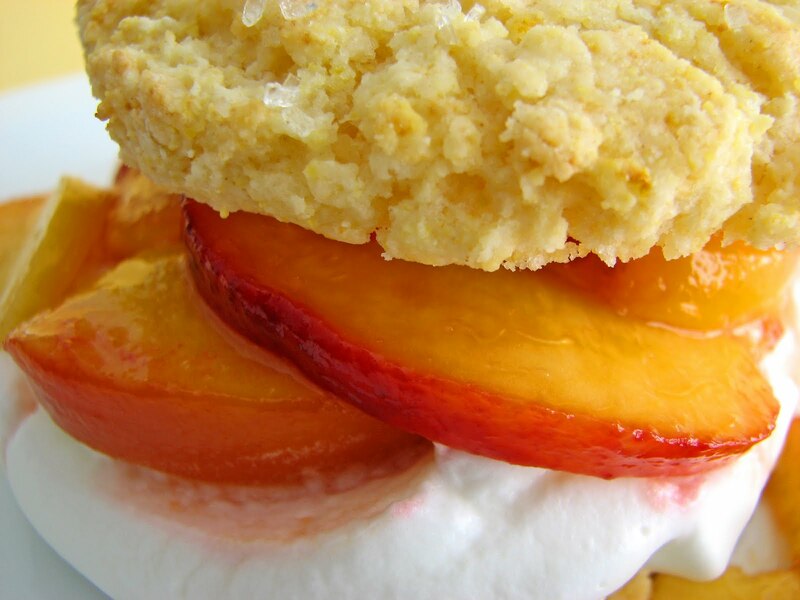 Serve with Apricot Compote.